He loved lifting more than the sport it was intended for in high school. 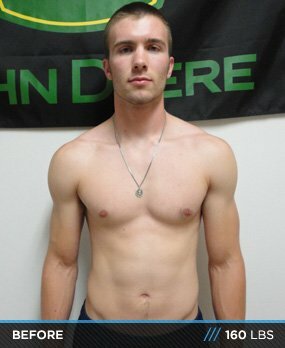 When he hit college, Joe pushed his boundaries further and added serious bulk to his six-foot frame! 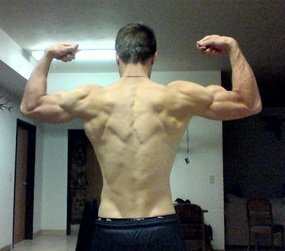 The main reason I got really into bodybuilding was after I graduated high school. I was done with sports I needed something to do. In my training for sports in high school, I always enjoyed lifting weights more than I actually enjoyed the sports themselves. Once I got to college, I was not happy with the way I looked and I felt something needed to be done, so I started devoting most of my free time to weight training; I have not stopped since then. I started bulking in August because I felt that I was too small. At first, I trained mainly for strength by lifting in the lower rep range. I was getting way stronger and being really consistent with my workouts, but not really noticing results in the mirror, so I finally decided to take on a training split and start watching my diet closer. I continued to bulk until April and reached 180 pounds. After watching my diet closer, my results went through the roof. After I reached 180 pounds, I was happier with my size but wanted to get more definition for summer, so I started a cut. I'm currently around 173-175 pounds with a lot more definition. My diet consists of mainly all nutritious foods. I watch my calories and macros closely and I believe that what is contained in those daily calories need to come from quality foods. Junk food is sometimes added as a treat on weekends to keep my cravings from getting too intense. I never drink alcohol or do any kind of drugs. Whether I am cutting or bulking, the same rules apply for my diet, I go 1-1.5 x bodyweight in protein depending on how lean I currently am, .45 x bodyweight in fat, and I just fill in the rest of my calories with carbs. Below is an example of what my daily diet consists of during my cut (which is what I'm currently doing). All this plus my supplements equals about 2400 calories, 250 grams of protein, 75 grams of fat and 180 grams of carbs. I have always believed in training to failure; it has always yielded the best results for me. I rarely ever repeat the same workouts more than once. Not that I believe that it's best for "muscle confusion," but because I love to train and try out new things. I believe if you are giving 100 percent effort during your lifts with correct form, you will get results with proper dieting. I like to train with high volume and add in extra frequency for the body parts I like to train the most. I train in the rep range of anywhere from 6-50 reps, but most of the time I'm in the 8-15 range. I care way more about form than weight. I feel I can get better results by using lighter weights with perfect form as opposed to heavy weights with sloppy form. I am not just looking for help with my ego by using heavy weights; I like to get the most out of the muscle that I can. Since I don't have a set workout routine, I will just give an example of what a week may look like. Diet and consistency are the keys to success. Never give up due to lack of results at first, they will come in time. Don't get caught up in wondering which training style and diet works best; over time you will learn what works best for you.